The style and hair of Brad Pitt have changed a lot in recent years. With the long hairstyles that Pitt has worn throughout the last decades, he has become a true trendsetter. He doesn’t look like the young, restless, handsome cowboy Tristan Ludlow that he played in Legends of the Fall back in the nineties. Nor does he look like the rough and strong Greek warrior Achilles that he played in the 2004 movie Troy and that every woman out there fell in love with. But one thing he still has frequently had in common with those characters is his iconic long hair. Now Brad Pitt is in his fifties. He has aged, but he has aged with style. Women around the world still dream about him and men want to look like him. 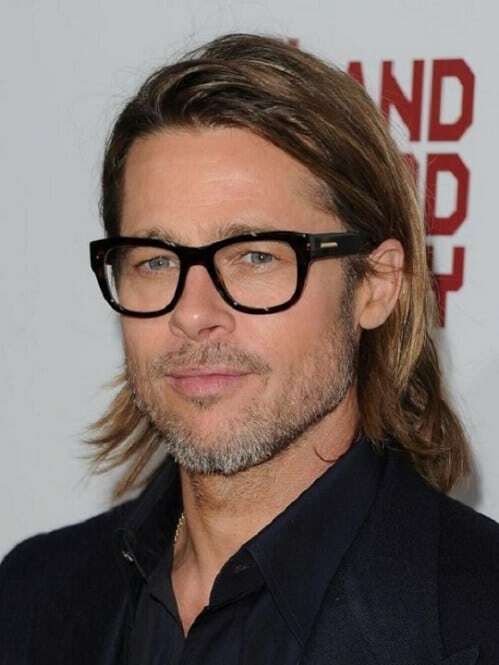 Achieving Brad Pitt’s long hairstyle will require some planning and working closely with a professional stylist. They also require the use of products that both condition and maintain the structure of the cut. Many have tried to copy Brad Pitt’s hairdo, and now we have decided to present to you seven of the long hairstyles of Brad Pitt from the last few years that we consider the most iconic. Speaking of a pompadour haircut, don’t think Brad Pitt hasn’t worn it! You may be wondering why this retro and amazing hairstyle that was popular in the ’50 and the ’60 is on our list of long hairstyles, but if you look closer, it definitely requires the hair to be of a decent length. When it comes to the hairstyle itself, you sleek the hair on the sides towards the back, using a generous amount of hair product. You also blow dry the fringe backward keeping the volume of the hair. Why is the style of the beard related to the hairstyle? Well, if we’re talking about Brad Pitt, it most certainly is. In recent years, whenever he would grow his hair long and style it effortlessly loose, he would combine it with a goatee as a sort of a trademark. The prestigious actor is no stranger to playing with mustache and beard that would accentuate his long hair even more. This is one of the classic long hairstyles that Brad Pitt sported. Similarly to the example, we’ve presented above, a stubble was a great option to match his chin-length hair that he tucks behind his ears. It makes his overall style look cool and laid-back and his face looks younger. 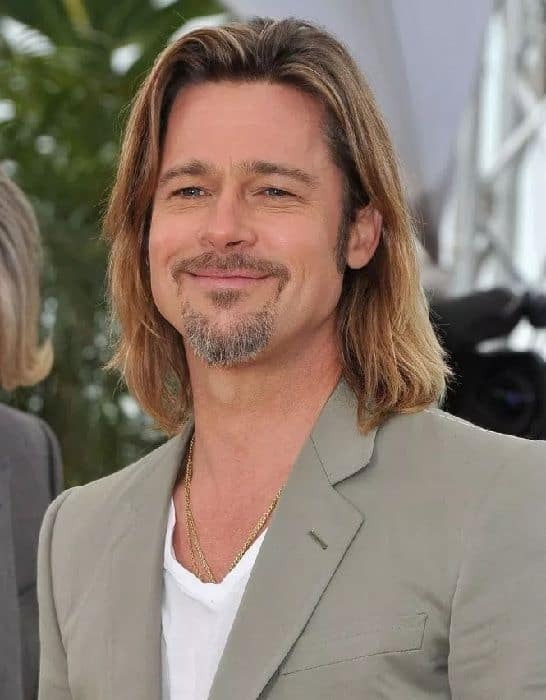 Another masterpiece of Brad Pitt long hairstyle combo! When the actor’s hair pass shoulder length, he started frequently wearing it in a low ponytail or a low messy bun which only complimented his rockstar look. For men who are chic and patient enough to carefully style their hair, even if it’s for a special event, this could be a great inspiration. Curling your hair will make you look retro and trendy at the same time, as this hairstyle has made a comeback in recent years. Also, if you are in the process of growing your hair, you can still experiment by creating a long hairstyle as Brad Pitt did. It also kind of reminds us a little bit of a pompadour. If you have wavy hair and want to achieve this look, you will need to have your hair straightened in order to get the smooth look that you are seeking. The illusion of fullness and volume is achieved through the use of highlighting and lowlighting that is strategically applied to give the style a sun-kissed look. 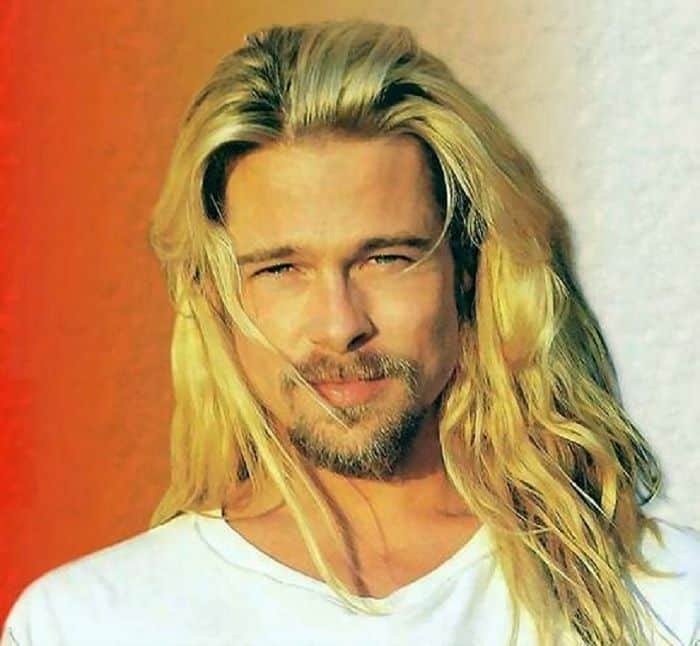 Some of Brad Pitt’s long hairstyles have much lighter blonde highlights that give the illusion of a person who spends extended periods of time in the sun. This style works well with a face that is symmetrical and has clearly defined features and strong lines. This style is great for casual events or occasions. However, when you are going to be spending time in the sun, it will be important that you wear head protection to avoid damaging your style. The style does not frame the face, but rather is set apart from the features which gives the look a much less structured look. 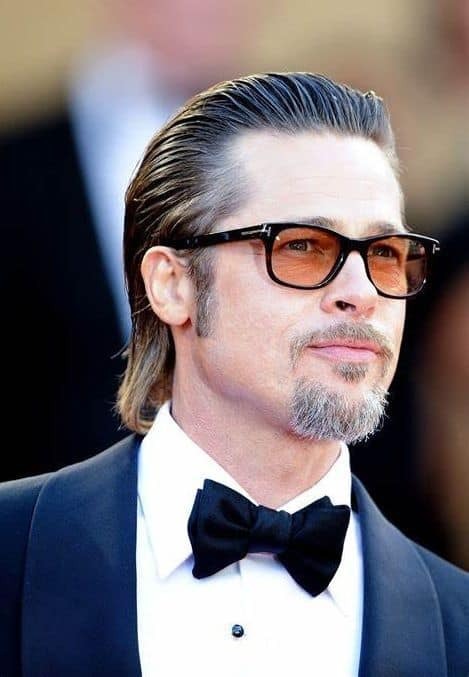 When you are considering this Brad Pitt’s hairstyle, start with hair that is longer in length will give the stylist the length that is required to achieve the depth needed to give the light layering that takes place throughout the look.